A tale of two soups! Burgoo, as listed in my Food Lover's Companion is a thick stew full of meats and vegetables. It's popular for large gatherings in America's southern states. I'm glad I ran across this definition by chance in the book a few weeks ago. We had planned way in advance to go to the Burgoo Festival in Utica, Illinois this past Sunday. I thought it was just a cute name for the festival, but now that I knew it was based around big pots of stew I was excited! There were huge individual cookers full of the stew, all lined up. It smelled delicious in this area and workers were stirring with the big oars, pulling out big stew pots worth of the stew, and serving it up into little cups. Here's me and a goofball Johnny enjoying our little bowls of burgoo! It was a chilly day, in the 40's, so a warm cup of hearty stew was welcome! Today we ate a really late lunch, so we weren't hungry for dinner until really late. I don't like to eat big meals late, so I opted for a fallback we use on lazy nights. It's a kicked up ramen! Ramen is a really cheap, fast meal. I always have some on hand in the pantry, but I never make it according to instructions. I'll show you guys another favorite dish with ramen next time I make it! Did you know there's tons of cookbooks devoted to cooking with ramen!? It's a great starter for a dish. 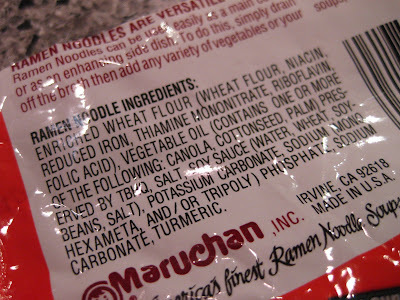 Ramen gets a bad name because the seasoning packet is chock full of nasty stuff. The noodles aren't that bad, though! See?? Into a small pot goes 2 cups of water. Then, just throw in a mixture of whatever fresh and frozen veggies you have on hand and bouillon of your choice. I prefer to use a vegetarian vegetable bouillon that is a lot healthier and way less salty than the ramen packet. You could also use stock or broth, whatever your preference, or what's on hand. Feel free to also throw in any leftover proteins you have on hand, too! Once it's boiling and the veggies have a head-start in the cooking, throw in the block of noodles. Set the timer for 2 minutes and viola! you have a simple, fast, healthy dinner. Oh, I forgot to mention that Sarah! It doesn't list whey specifically, but we know it has dairy b/c J can't have it! Oh I love homemade ramen (like Sarah - no dairy)! I love that you went to that Burgoo festival! I don't even know where Utica is! I'll have to look that up. I like your idea of the Ramen soup too. I sometimes take the noodles add the veggies, a little stir fry sauce and sometimes Trader joe's potstickers. It makes me so happy! I'm totally going to make that for my lunches next week, thanks for the idea! Such a great idea to add some color to your ramen!! Gettin' in the VITES!! Oh I love cheap ramen! Especially when it's ramped up with goodies. Burgoo, never had it sounds killer. You are a doll Christina! Did you ever see the show on Food Network - Feasting on Asphalt with Alton Brown? They went there for burgoo and I think they said originally they used squirrel meat! haha i love ramen noodles. I wen through such a phase in 7th grade. All I ate was ramen for dinner. This is a great idea. I will definitely be trying this on the fam. nice soup!!! that looks great!